WESTBROOK — The Walking Man, the larger than life sign on the corner of Hardy and Bridgton roads, may join the annals of historic places in the state. The Maine Historic Preservation Commission later this month will consider the landmark sign for nomination to the National Register of Historic Places. 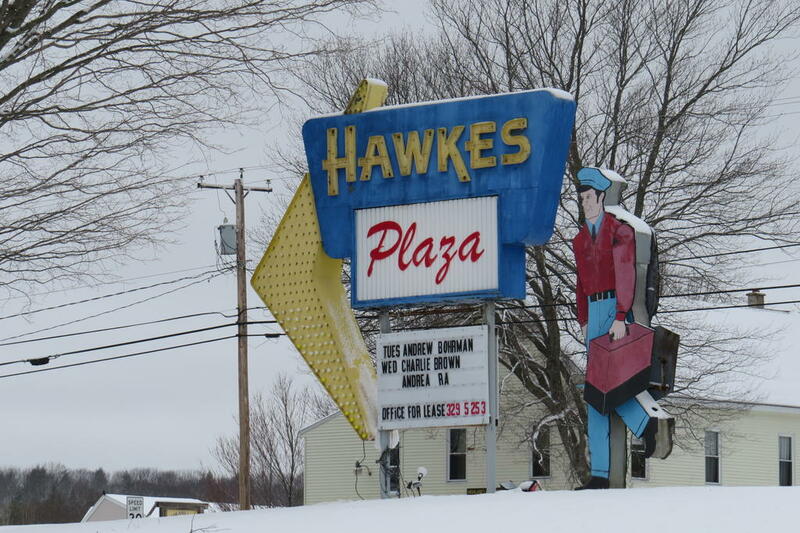 The 13-foot-high, moving sign was constructed in 1962 by the late musician Al Hawkes to drive business to his nearby television sales and service business. Although the business has long been closed, the sign still reminds motorists of a time gone by. Bill Umbel, who now owns the sign, is part of the latest effort to protect the sign for its historic significance. He has worked with Greater Portland Landmarks and the Westbrook Historical Society to do so. In March, the city received a letter from State Historic Preservation Officer Kirk Mohney, announcing its consideration for nomination to the registry. “Listing in the national register provides recognition and assists in preserving our nation’s heritage,” Mohney said in the letter. “The property owner has reached out to us for a listing and we feel it is eligible in terms of its commercial and art components. It’s a pretty unusual sign in the local area,” said Michael Goebel-Bain of the Maine Historic Preservation Commission. Umbel said getting the sign placed on the register would certainly be something Hawkes would have loved to see. “It’s the most highly recognized landmark (sign) in the state after the Big Indian in Freeport,” said Umbel, who operates Lenny’s at Hawkes Plaza, a restaurant/music venue next door to the sign. He said all he has to do is tell people Lenny’s is next to the iconic sign in order to direct them to where they are going. The Maine Historic Preservation Commission’s 11-member state review board is scheduled to consider listing the Walking Man sign at its meeting at 10:30 a.m. April 26 at the Maine State Library in Augusta. If the board agrees, the nomination will be passed on to the National Park Service. Goebel-Bain said the Park Service will have the final review to make sure the documentation is correct, that the sign meets meets National Register standards and the characteristics that define it are still intact. Phil Spiller, a neighbor, would like to see the sign honored. He was part of a push several years ago, along with the Westbrook Historical Society, Greater Portland Landmarks and local business owners, to get the sign listed on the historic register, but the process stalled. After Hawkes’ death in December, Spiller again contacted the Maine Historic Preservation Commission. “I personally felt saddened – and disappointed in myself – for not continuing the application process for the past two years and that Al hadn’t lived to see the unique Walking Man creation he and his father built in 1962 come to be listed on the national registry,” Spiller said. The National Register listing, if successful, would apply only to the sign and not Umbel’s restaurant, which occupies the space where Hawkes operated his television sales and service spot and Event Records, a small label that recorded many notable country bluegrass artists in the late 1950s/early 1960s. Prior to Hawkes operating his record studio/television business there, Spiller said the building was used as a blacksmith shop by James F. Hawkes, Al’s great grandfather between 1879 and 1915. An effort a few years back to list the entire Duck Pond intersection, which was a frequent stop on the old stagecoach route from Portland to Bridgton, on the National Register failed because much of the historic fabric of the area had been lost. Umbel said since many in the music world think of his building as a historic local site for local bluegrass music, he has considered playing up the building’s significance. “I’ve been approached by a lot of people to include some sort of museum aspect to what we are creating with Lenny’s,” Umbel said. If listed, The Walking Man sign, would join a list of several places in Westbrook that have been noted for their historic significance, including the Cumberland-Oxford Canal; the Cumberland Mills Historic District, Nathan Harris House at 425 Main St., the Vallee Home at 36 Monroe St., as well as the Walker Public Library, former Warren Block and former Westbrook High School site on Main Street. The Maine Historic Preservation Committee will consider listing the Walking Man sign on the National Register of Historic Places. The sign was constructed in 1962 by Al Hawkes to drive business to his television sales and service store. Bill Umbel plugs in the refurbished Walking Man sign in February 2016 as Al Hawkes, who constructed the sign more than 50 years before, looks on. The sign may be listed on the National Register of Historic Places.